When a company goes bankrupt, it’s often workers who are left in the lurch. 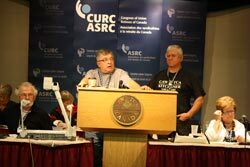 Three different speakers outlined two approaches to facing the loss of pensions and benefits which comes with a bankrupt company at CURC’s 10th Constitutional Convention in Port Elgin ON. Members of the Communications, Energy and Paperworkers Union of Canada (CEP) have launched a fight to change Canada’s bankruptcy laws after the sudden collapse of Fraser Papers in New Brunswick and Quebec left workers with a 30-40% shortfall in their pensions. Members of CAW Local 1451 in Kitchener ON occupied a plant to protect their pensions after the giant Thiessen-Krupp conglomerate closed a profitable auto-parts plant. The CEP members began their fight in early October, when they formed the Victims of Brookfield Association. Fraser Papers, their former employer, was owned by Brookfield Asset Management, a giant Canadian company with $150 billion in assets. Brookfield decided to take Fraser, which had been profitable for years, into bankruptcy as part of a reorganization of their paper-mills division. The CEP is launching a campaign of demonstrations and media to call attention to their situation and to shame Brookfield into treating their pensioners fairly. Broofield “are crooks. There’s no other way to put it,” Bezeau said. The union is also launching a legal challenge to force the company to restore the pension benefit. In Kitchener, the members of CAW Local 1451 managed to protect their pensions, although they lost their post-retirement health benefits, when their plant closed in 2009. The CAW members fought back by holding an information picket in Oakville outside of another Thiessen-Krupp plant. But the information picket turned into what Devine described as a “plant tour” by all 500 of the picketers. “I didn’t have to look behind me to know the members of Local 1451 were there” when he led them into the plant, Devine said. Both Devine and Roger Lee, chair of the Local 1451 retirees’ chapter, said the members’ action forced the company to sit down and negotiate. As a result, the company agreed to fully fund their pension and annuitize it. “That information picket was worth $20 million,” said Devine. “Clearly, our benefits were gone. But we tried to get as much for people as we could. Management lost their benefits too. They thanked us at the end of the day. “Fighting back does make a difference,” agreed Lee.